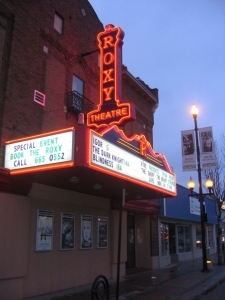 The Roxy in Saskatoon stands proud in the Riversdale neighbourhood of Saskatoon, Saskatchewan. 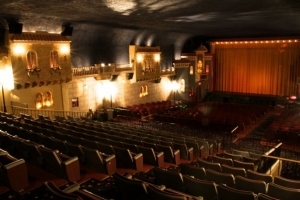 Built during the depression, the Roxy, is the oldest and most stylish theatre in Saskatoon. According to the Riversdale website, the Roxy’s architectural design was influenced by Spanish colonial styles. Designed by F.F. Maistre of Winnipeg, the interior lobby consists of two curved ramps leading up to the auditorium, the walls containing small balconies and windows and towers evoking a Spanish Villa style. The ceiling is painted in dark blue with twinkling lights recessed in the plaster to give the illusion of a night sky. The theatre opened in August of 1930 screening the film Is Everybody Happy (1929) by Archie Mayo. The Roxy closed in 1995 but was recently was restored by Rainbow and Magic Lantern Cinemas with most of the exterior and interior architecture remaining true to the original design. The Roxy reopened in 2005.